Hundolin is a Bosmer warrior who is the bookmaker in charge of betting at the Arena. From 9am to 9pm every day you can find him at the front entrance to the Arena. If you place a bet with him (for 25, 50, or 100 gold), you can then go through the spectator booth door and watch the match that you just bet on. If you win, return to Hundolin to get your winnings. He wears a middle-class outfit consisting of a quilted doublet, a pair of tan linens, and some doeskin shoes. He also carries a small amount of gold. He sleeps on one of the bedrolls in the Arena Bloodworks every night between 1am and 8am. After waking up he immediately heads outside and strolls around near the Arena entrance until opening time at 9am. For the next twelve hours, Hundolin takes bets from the many Imperial City gamblers until the Arena closes up at 9pm. He then travels to the Elven Gardens District and treats himself to dinner on The King and Queen Tavern. At 1am he heads back to the Bloodworks, finds himself an available bedroll, and falls asleep. The first time you see him, Hundolin will notice you are not a regular and give a detailed description of the Arena: "Hello there! Welcome to the Arena! I don't think I've ever seen you around here before. I know all the regulars, believe me. If you're looking to join the Arena as a combatant, you need to head down to the Bloodworks and talk to Owyn, the Blademaster. If you're here to bet on a fight, on the other hand, you're talking to the right man! There are matches all day long, from 9:00 AM to 9:00 PM. That's a lot of chances to fill your purse with coin. So what do you say: you want to bet on a match?" He will be quite sad if you tell him you do not want to bet on a match: "Oh, all right. Very well then. If... um... if you need anything, please just ask. I'll be happy to take your bet if you change your mind." If you tell him you want to bet on a match, he will happily reply with, "Ah, excellent! I knew you were the gambling type! Well, you can bet on the Yellow team or the Blue Team. The teams are evenly matched, so you've pretty much got a 50/50 chance of winning. So, which team would you like to bet on?" If you choose to bet on the Blue Team, he will reply with, "All right, then, the Blue Team it is. How much do you want to bet?" Similarly, telling him you want to bet on the Yellow Team will have him reply with, "All right, then, the Yellow Team it is. How much do you want to bet?" Whether you choose to bet 25, 50, or 100 gold and which team you chose to bet on will affect his next reply when you tell him how much you're betting: "All right, my friend. You've got 25/50/100 gold down on the Blue Team/Yellow Team. Good luck, and enjoy the match! Oh, and if you win, come see me for your payout!" Talking to him after you place your bet will have him quickly tell you, "You'd better get up to the Arena or you'll miss the match! Just head through those doors on my left. If you win, come see me to collect your gold." If your team lost, he will feel somewhat sorry for you but urge you to continue betting: "Ah, sorry friend, but it would appear the opponent you bet on lost that last fight. Better luck next time!" If your team won, his dialogue will vary depending on how much gold you bet: "You won! Congratulations! Here are your winnings, my friend -- 50/100/200 gold pieces. Come back and bet on the matches as often as you like!" He will immediately exit dialogue after telling you about your victory or loss. On subsequent visits to the Arena, Hundolin will greet you like a regular, quickly getting down to business: "Ah, another happy spectator! You of course want to bet on a fight! Who will it be this time, the Blue Team or the Yellow Team?" You can choose a team to bet on which will result in the same dialogue as before. However, you can tell him you do not want to bet on a match, causing him to take an apologetic tone and reply: "Oh! Sorry, I... I just assumed. Well, if there's anything else I can do for you, please just ask." You can ask him about how to become a combatant in the Arena, which he will tell you: "If, by any chance, you're interested in actually fighting in the Arena, you need to head down to the Bloodworks and speak with Owyn, the Blademaster." He will continue on, giving you some advice about dealing with Owyn: "Just head through the door here on my right and take the stairs down. Be on your best behavior, though. Owyn is a bit... cranky by nature." This will cause the Arena quest to start. If you ask about betting on a match, he will run through the basics with you: "You can bet on either the Yellow Team or Blue Team. The opponents are always evenly matched, so your chance of winning is 50/50. For each fight, you can bet 25, 50 or 100 gold pieces. You can bet as many times as you want per day, within the hours of 9:00 AM and 9:00 PM. If you win, you get back double what you bet. Simple as that. Win or lose -- it's mostly a matter of luck." If you talk to him when you are scheduled to fight in the Arena, he will see that something is not quite right and say, "Don't you have a fight scheduled? I'm sorry, but I can't allow you to bet on your own match! You'd best get into the Arena!" If you talk to him anytime before 9am or after 9pm, he will state his job but also that he cannot help you right now: "Yes, I'm the city's Arena Gatekeeper, but I'm not on duty now. If you want to bet on a fight, see me at the Arena between 9:00 AM and 9:00 PM." He will close dialogue by saying, "Have a good day now." 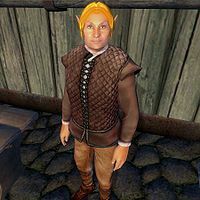 As with numerous other NPCs, Hundolin doesn't employ the principles needed to participate in the Speechcraft minigame. Esta página foi modificada pela última vez à(s) 15h34min de 13 de dezembro de 2015.